I have a number of games on my Milestone, but I don’t use it as a serious gaming device. It’s nice to have something in the case of a long commute or a quiet moment between classes, though. I’ve taken advantage of Angry Birds and it’s free license, and engage my puzzle-craving side with Frozen Bubble. 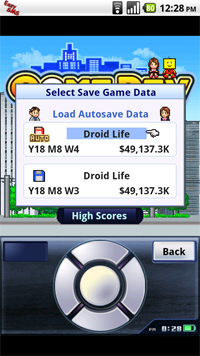 However, a recent Android release, Game Dev Story, has achieved something that those other games never have: it has made me contemplate uninstalling it based on how addicting it is. I have a long and storied history with simulation games: I love them, and many hours of my childhood were spent on Rollercoaster Tycoon and The Sims. While I still can’t build a decent SimCity, I can appreciate quality where I see it. 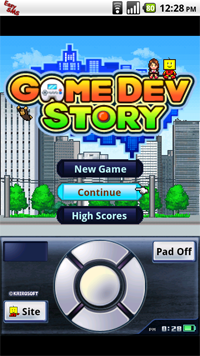 Game Dev Story is a recent Android convert, coming to us from Japanese developer Kairo Park. While that fact that GDS was first released on iOS might deter some people from checking the game out, I assure you that it’s a good enough port that I couldn’t tell that it wasn’t an original Android game. It looks slick and feels extremely comfortable. 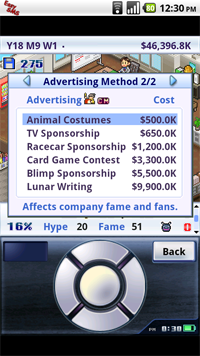 For the uninitiated, the game simulates your creation of a video game company and your quest to make lots of money. You start off with the ability to develop for the PC platforms while consoles are released and discontinued along with the flow of time: this is a treat for gaming historians when you see the slightly-altered names and how the “Virtual Kid” might be a stinker. 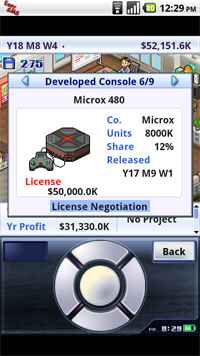 Your company can hire/fire employees, level up their attributes (writing, graphics, music and coding), advertise your product, buy licenses to develop for consoles, attend developer conferences and game awards, all the while taking contracts to make capital to make more games. While this seems like a lot to take in, Game Dev Story is easy enough to pick up; I was making AAA Titles after roughly a couple hours of playing. Games are created in a type/genre system, which allows me to make such amazing combinations like “Ninja/Racing” or “Historical/Puzzle” games. Different mixes have different success rates, and most good mixes are pretty logical (like “Checkers/Puzzle.”) Your employees then work on the game, and if the game has high attributes, it will sell well. The controls are great, as you can choose between touch controls or an on-screen d-pad with center button. I had discovered this soft controller right before writing this review, but it worked well enough that I have no complaints. Then again, the controls are simplistic: choose a menu option, go forward or back. Not much to it, but they work well. My only complaint is that you can’t switch between top-level options on the main menu once you’ve clicked on something – you have to go out of the menu and restart the process. Luckily, this isn’t a taxing process, as menus only go two or three levels deep. The graphics are gorgeous for pixel creations; there’s such personality in the employee that I have grown attached to them. 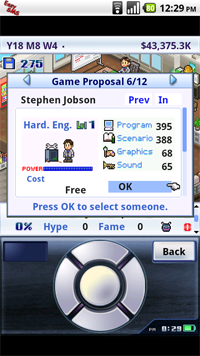 Ironically, my star programmer is named “Stephen Jobson.” It’s a very simplistic art style, but it does the job well; there’s no real need for 3D graphics when a lot of what you’re watching is a dollar amount pile up. The only complaint I had is that there’s no way to play the game in landscape mode; you’re locked into portrait at all times. As a guy who likes to utilize all his resolution, it’s frustrating to see black bars at the top and bottom. The music is a bit annoying after awhile, but it’s good for chiptunes. Like a lot of simulation games, it begins to grate with extended playing sessions, but that’s not a sign of low quality; just a lack of foresight. Also, the sound effects as your games’ attributes stack up are a cascade of notes growing in tone, which can get annoying for particularly long chains. Hearing a note for 3 seconds is fine and well, but for 10-20? Not fun. 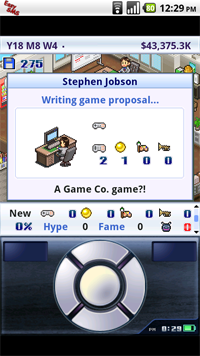 Ultimately, Game Dev Story is a well put-together package of a game, and gives us something important in mobile gaming: addicting gameplay that’s easy to pick up. While it’s a little deeper than most games, it’s not prohibitive to the player: you don’t have to read a FAQ or keep track of market data on an Excel spreadsheet to get ahead. At a $2.50 app price, I want something that challenges me a little bit more; I still recommend Game Dev Story highly, but as something to play in small doses. It seems to be the type of game that is made for user-created “hard modes”, like not using purchasable boosts or only using one employee. If any of you have any ideas, be sure to let me know. Matt Demers is a Toronto journalist who really needs to stop gaming and get back to paying attention to lecture. You can follow him on Twitter.